With 29 votes in favor, none against, and one abstention, Queens Community Board 5 overwhelmingly endorsed DOT’s safety plan for the Myrtle-Wyckoff transit hub last night. The project would significantly reduce potential conflicts between turning drivers and pedestrians, mainly by creating a car-free plaza on Wyckoff Avenue between Gates and Myrtle [PDF]. Pedestrians outnumber motorists at the six-legged Myrtle-Wyckoff intersection, located at the junction of two subway lines and six bus routes, three to one, according to DOT. But it’s not safe — three people have been killed while walking there since 2009. While the city implemented minor changes in recent years, the new turn restrictions weren’t enough. A turning bus driver struck and killed Edgar Torres in 2014 after the changes were made. 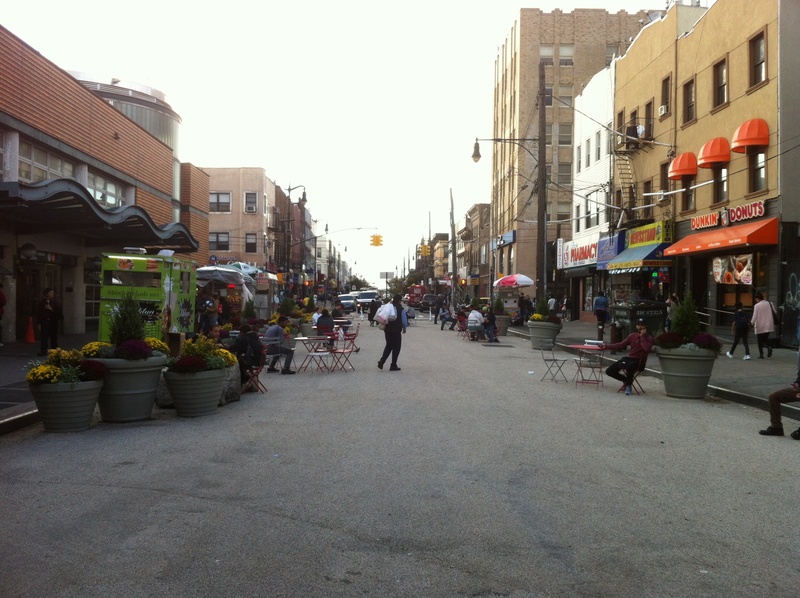 The car-free block will further simplify turning movements and give pedestrians a safer path between the Myrtle-Wyckoff subway station and the Ridgewood Bus Terminal on Palmetto Street. In 2013, Judy Kottick lost her daughter, Ella Bandes, when a turning bus driver struck and killed her at the intersection. “It was very gratifying that Community Board 5 really considered the redesign and gave us their support,” said Kottick, who attended last night. Not one person spoke against the project during the meeting’s public comment section, she said. The project straddles Brooklyn and Queens, and Brooklyn CB 4 voted against it last month. Council Member Antonio Reynoso, who represents parts of both community districts, has argued that DOT should move forward with the project regardless of what the boards advised. State Senator Joseph Addabbo also testified in favor of the project last night, as did a representative from Congresswoman Nydia Velazquez’s office. It’s up to DOT whether to move forward with the project. Streetsblog has asked what the agency plans to do next and has yet to receive a reply. So the bus only lane on Palmetto St south of Myrtle Ave is the only piece of the project at risk due to BK CB 4? Wonderful news. This intersection was nasty and if ever there was an area that needed more real estate dedicated to pedestrians not car gridlock, this was it. With all the heavy hitters on board, DOT will surely move forward. The errant community board doesn’t have a leg to stand on. It’s the only piece that was missing from the presentations given to QN CB5 after BK CB4’s vote. But then how will drivers get from Gates Avenue to Myrtle Avenue? Oh wait they intersect anyway. It’s hard to see how anyone could debate this. I was on the Q58 on Fresh Pond Road and a truck was double-parked in front of the bus and unloading. The bus had to wait to change lanes to get around the truck. It probably happens everyday. I asked the driver is this was OK. He said no it was not. I asked a bus driver parked on the proposed Wyckoff Avenue plaza location what he thought about a plaza. He said I don’t think it is going to happen. Would you tell a doctor or a surgeon to pack up and move around the corner? The word MTA appears only once in the entire document. If anything, the DOT should come in behind the MTA and the NYPD and let them do their things first. Double-parking and similar problems will shift to other streets. http://gothamist.com/2016/04/01/dangerous_intersection_at_myrtle-wy.php This post has been added below. This post is over three months old and some of the suggestions in it have not been implemented yet or repeated in any news article referring to the proposed plaza. Two of the most important changes only need a ladder and an adjustable wrench to get done. Instead of studying vehicular traffic, the DOT should have focused on pedestrian traffic and accounted for most pedestrian’s actions. Did someone use the Brooklyn Bus Map to find the B52 bus stop, etc? Did someone use the Queens Bus Map to find the B54 bus stop, etc? That person would also be crossing Wyckoff Avenue unnecessarily. Pedestrian traffic is a major research field now with the coming of autonomous vehicles. Luckily, I found this out by chance. The DOT should be looking at this research now, which they probably are. Some of it applies to Wyckoff Avenue now. Soon, all of it will. How many people come out of the subway in Manhattan and have lost their sense of direction when they get to the street level and seek assistance or start a trial and error process of figuring out which way to go? There’s a simple solution to this problem. Stencil or place a north arrow on the last subway stair step or in front of an elevator door. It’s all about reducing the probability of an accident. Unnecessary street crossings happen all around the area. I have done it myself and that is why I have an interest in this issue. Ironically, the Ridgewood Property Owners and Civic Association: RPOCA, which was so vehemently and in hindsight, perhaps wrongly, against the Fresh Pond Road Street Fair did not take a stand on this issue even though it was fully aware of concerns of at least several of its members. It was not the first time it was wrong about Fresh Pond Road. I once met a woman elsewhere in the country that was seriously considering becoming an ex-patriot because the powers that be were making her commute more arduous than it should be. She was unconsolable. Her language was a wad more colorful than what I am using here. The DOT also implies that a poll of 130 has statistical significance which is unproven since 130 people not in attendance and 130 motorists were not polled. Wyckoff Avenue is an important road for drivers going east to the Jackie Robinson Parkway, Atlantic Avenue, the Belt Parkway and Nassau Expressway, Rt. 27 and Sunrise Highway. Drivers going west are headed to the BQE and bridges and tunnels. Its not only Cooper Avenue and Flushing Avenue. To reroute this traffic goes against common sense. Greater compliance from motorists could be achieved with a greater presence of the NYPD like on 2nd Avenue and 60th Street in New York. Those officers are amazing and Wyckoff Avenue could use some like them. Cypress Avenue has enough traffic going east and west already. Are motorists going to like to go to Central Avenue? I once notified the DOT of concerns at another dangerous location: Rentar Plaza, both of them, in Middle Village. Nothing became of it. A poll of 130 people needs to be taken there too. CB5 needs to careful coming out of CK. Nothing new in MoveNY that wasn’t discussed in the media, and on peoples’ minds forty years ago. Tolls on the bridges should have been enacted in 1976. It would have been foolhardy for any politician seeking reelection to take this stand at that point in time. Think of all the money the city would have by now to fully implement Vision Zero. Since the average man or woman on the street, AKA the taxpayers, don’t know what is going on behind their backs, the DOT could get out their colored pencils and design a nice big supersized plaza for the Boulevard of Death. How about in front of the Queens Center? Nice to learn that Queens Boulevard is already on the boards bigtime. But, if a plaza would not work there, why should it work anywhere? To achieve the goals of Vision Zero fully, the program should be administered by a quasi-governmental organization like the NYCEDC or a P3: Public Private Partnership. Street modifications alone are not the answer to reckless driving. 99 and 44 one hundredths per cent of scofflaws need to be identified. The NYPD would correctly argue that it should be 100%. Coordinating the various groups: DOT, MTA, NYPD, Google, Microsoft, DSNY (Yes, do I have to walk across the street to get rid of my trash?) is best done with an impartial organization. Since Vision Zero is nationwide and international, New York City should take a lead by doing this right. I was at the IS-77 meeting on Vision Zero/Plaza at Myrtle and Wyckoff on 03/29/2016. 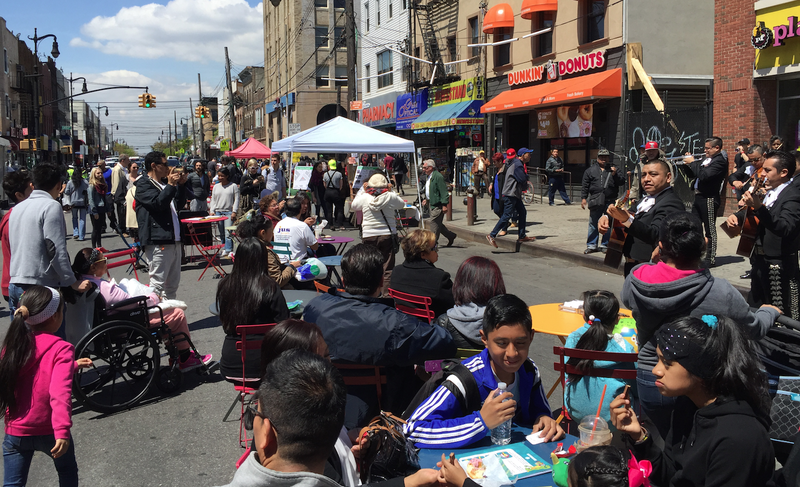 A permanent plaza is like having a permanent street fair on Fresh Pond Road. The DOT seemed unaware of the coming M and L train disruptions and how the MTA must run shuttles at Myrtle and Wyckoff. They also seemed unaware of the large construction projects underway nearby. I foresee many more coming too. I presented the MTA, also in attendance, with errors at Myrtle and Wyckoff on the current Brooklyn Bus Map, the current Queens Bus Map and Google Maps. As I must travel to all five boroughs from Myrtle and Wyckoff, I have absolutely no reliable information product other than trial and error when I get there. I was surprised at how bad Google Maps was since it is normally good with bus stops elsewhere. I have notified them already but this is no easy fix. I have also sent feedback to Microsoft’s Bing Maps about bus stops at this location. The most needed item at Myrtle and Wyckoff is proper signage directing commuters to the correct bus stop location. Anybody crossing a street and not knowing exactly where they want to go is at a greater and unnecessary risk. I returned to the Ridgewood Intermodal Terminal at Myrtle and Wyckoff today to double check my facts. The sign at the Myrtle Avenue underpass directs Brooklyn bound B26 and B52 riders to the McDonalds area. The B13 sign still is hanging on Palmetto Street. Between the overhead girders of the M train and the sidewalk bridge scaffolding at the construction site, the bus stop signs for the B26 and B52 are practically invisible. This happens elsewhere wherever there is an overhead train, like on Broadway for instance. Sunrise and sunset can make seeing these signs even harder. I was riding on the Q58 this morning and realized that the Ridgewood Intermodal Terminal is counterintuitive and has been that way for decades. If it was intuitive, there would be no need for signage or maps or smartphone apps. The front of the Brooklyn bound buses: B26, B52 and B54 should be on the west side of Palmetto or Gates. The front of the Queens bound buses: Q55 and Q58 should be on the east side of Palmetto or Gates. There should be at least one designated taxi stand. The recent diversion of the Q58 to Ridgewood Place could also be applied to the Q55 with only a favorable impact. MTA traffic engineers could figure out how to handle the Brooklyn bound buses best: Palmetto or Gates? For instance, the B26 could turn up on Madison and follow St. Nicholas like the Q55 does now and turn left on Palmetto or Gates. It seems that there are quite a few possibilities out there that need to be explored. The MTA map makers need to tighten up a bit on the details and revise the maps more frequently as situations change. Coordination with the digital map makers also needs to be tightened up. Perhaps the thickness of the bus lines needs to contracted to allow more detail at the terminal stops. The area needs to be monitored with cameras and human beings for speeding, jaywalking, illegal turns, etc. Existing bus drivers and other MTA employees need to be interviewed for their opinions regarding what they have observed. I believe one should think twice before going against the original architect’s intent when renovating a building. The same is true for the original city planner’s intent for Wyckoff Avenue. I could go on for 50 plus pages but I have to catch a bus. Believe it or not but I think all this is arcane and I’m glad it did not turn out to be my life’s work. What would Yogi say? It ain’t over till its over. Then your missing out Chacha! I saw three EMS/ambulance vehicles on Wyckoff Avenue between Myrtle and Gates Avenue within a ten minute period heading to the hospital on Stockholm Street. The city wants to change this? I wonder if the DOT ever spent ten minutes looking at this intersection? Can’t do it from an office in New York. My friend lives near here and he just sent me a photo of the new plaza. I saw the new one-way section being used as a two-way street during the five minutes I was at the intersection on Sunday. There are 288 five minute intervals in a day.